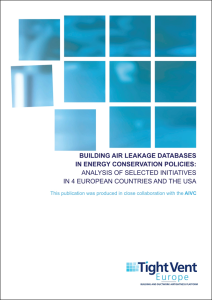 This document summarizes the information from five countries: Czech Republic, France, Germany, UK, and USA and provides an overview of recent efforts from a number of countries. This report gives a critical review of steps taken in 10 countries (Belgium, Denmark, Finland, France, Germany, Netherlands, Japan, Sweden, UK, USA) with regard to testing and reporting schemes as well as overall quality approaches to improve building airtightness. Highlights of the AIVC-TightVent & venticool 2018 joint Conference!